This is the first in the series of Halloween/Monster Toys Modern Vs. Vintage posts. Since I wrote the Mr. and Mrs. Potato Head article last month, I have to start out with the cool Potato Head Halloween toys available today. Isn't that cool? It's called a pumpkin push-in because it is actually 14 oversized Mr. Potato Head pieces that you can push into a real pumpkin. They also have a Mr. 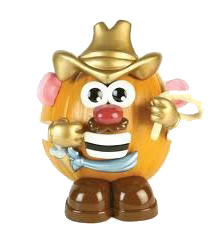 Potato Head Cowboy Pumpkin Push In Set , a Mr. Potato Head Skeleton Pumpkin Push In Set and a Mr. 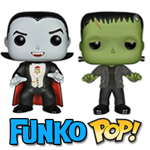 Potato Head Vampire Pumpkin Push in Kit ! What about Mrs. Potato Head? So as to not leave her out, also available is the Mrs. Potato Head Witch Pumpkin Push-In Set , the Mrs. Potato Head Princess Pumpkin Set and the Mrs. Potato Head Make a Diva Pumpkin . Aren't these great? I know they're technically not toys but they are giant Mr. Potato Head Pumpkins! I just have to get some of them. My favorite, of course is the Pirate. For your jack-o-lantern this year, switch to Potato Head Pumpkin Push-ins and put those knives and saws away! Check out even more Potato Head style push-in kits on my new post! Parts for both costumes come together in one set. It amazes me how many different themed Mr. Potato Heads there are now. After Halloween is over, you can even get the other holiday Potato Heads like Christmas Mr. Potato Head Santa Spud, Mr. Potato Head Valentine's Day Cupid Sweetheart Spud and Mrs. Potato Head Easter Bunny . None of these Mr. Potato Head Halloween items are vintage but the Potato Head's themselves are. I wish they did have these when I was a kid, don't you?